adhesion of the molecules of liquids, gases, and dissolved substances to the surfaces of solids, as opposed to absorption, in which the molecules actually enter the absorbing medium (see adhesion and cohesion). ..... Click the link for more information. ). The earliest use of this technique, by the Russian botanist Mikhail Tsvett (c.1903), involved the separation of highly colored compounds, hence the name chromatography [Gr.,=color recording]. ..... Click the link for more information. , ion-exchange chromatography can be used to separate them from neutral or oppositely charged compounds. The mixture is added to a column packed with a porous, insoluble resin which has a negatively charged (anionic) group attached to it and an unattached, positively charged (cationic) counterion. A cation from the mixture will exchange with the positive counterion of the resin and will be retarded while neutral and anionic substances are not affected. Ion-exchange resins with exchangeable anions work in a similar manner. a physicochemical method for the separation and analysis of mixtures, based on the distribution of the mixture components between a stationary phase and a mobile (eluent) phase that flows through the stationary phase. History. Chromatography was developed in 1903 by M. Tsvet, who demonstrated that by passing a mixture of vegetable pigments through a layer of colorless sorbent, the individual substances are distributed as separate colored zones. Tsvet called the stratified, colored column produced in this fashion a chromatogram and the method, chromatography. Subsequently, the term “chromatogram” has been used for various means for measuring the results of many types of chromatography. However, chromatography was not significantly developed further until the 1940’s. It was only in 1941 that A. J. P. Martin and R. L. M. Synge invented partition chromatography and demonstrated its wide possibilities for studying proteins and carbohydrates. In the 1950’s, Martin and the American scientist A. T. James developed gas-liquid chromatography. Principal chromatographic techniques. Adsorption, partition, ion-exchange, molecular exclusion (molecular sieve), and precipitation chromatography differ in the interaction responsible for the distribution of the components between the mobile and stationary phases. Adsorption chromatography is based on the difference in the adsorption of the various substances by the adsorbent (a solid with a highly elaborated surface). 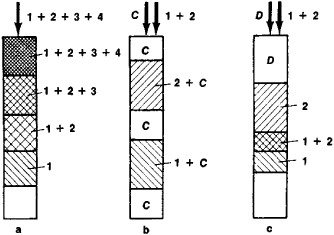 Partition chromatography is based on the different solubilities of the mixture components in the stationary phase (a liquid with a high boiling point applied on a solid macroporous carrier) and the eluent. (It should be noted that in the partition mechanism for separation, the adsorption interaction of the components analyzed with the solid sorbent also has a partial effect on the movement of the component zones.) Ion-exchange chromatography is based on the differences in the ion-exchange equilibrium constants between the stationary phase (ion-exchange resin) and components of the mixture to be separated. Molecular exclusion (molecular sieve) chromatography is based on the difference in permeability of the component molecules in the stationary phase (a highly porous, nonionic gel). It may be subdivided into gel permeation chromatography (GPC), in which the eluent is a nonaqueous solvent, and gel filtration, in which the eluent is water. Precipitation chromatography is based on the different capacities of the components to precipitate into the solid stationary phase. Gas and liquid chromatographic techniques are classified according to the state of aggregation of the eluent. Gas chromatography is subdivided according to the state of aggregation of the stationary phase into gas-solid chromatography (GSC), in which the stationary phase is a solid adsorbent, and gas-liquid chromatography (GLC), in which a liquid serves as the stationary phase. Liquid chromatography includes liquid-solid and liquid-liquid chromatographic techniques. The latter technique, similar to gas-liquid chromatography, is a partition chromatographic technique. Thin-layer and paper chromatographic techniques are liquid-solid chromatographic methods. A distinction is made between column and plate chromatographic techniques. In the former, special tubes, called columns, are filled with the sorbent and the mobile phase moves within the column as a result of a pressure difference. A variant technique uses capillary columns. Here, a thin layer of sorbent is applied to the inner surface of a capillary tube. Plate chromatography is subdivided into thin-layer and paper chromatographic techniques. In thin-layer chromatography, a thin layer of granulated sorbent or a thin film is applied to a glass or metal plate. Special chromatographic paper is used in paper chromatography. In plate chromatography, movement of the mobile phase is caused by capillary forces. Programmed changes of temperature, eluent composition, rate of eluent flow, and other parameters may be used in chromatography. The following chromatographic techniques are distinguished according to the means by which the mixture to be separated is moved along the sorbent layer: frontal analysis, development chromatography, and displacement chromatography. In frontal analysis the mixture to be separated is continuously fed to the sorbent layer; the mixture consists of a carrier gas and the components to be separated, numbered 1,2,3, and 4, and constitutes the mobile phase itself. Some time after initiation of the process, the least-sorbed component (for example, 1) overtakes the other components and emerges as a zone of pure compound; the other component zones emerge in sequence in order of strength of sorption: 1 + 2, 1 + 2 + 3, and 1 + 2 + 3 + 4 (Figure 1, a). In development chromatography a flow of eluent is passed continuously through the sorbent, and the mixture to be separated is introduced periodically into the sorbent layer. After some time, the initial mixture separates into pure compounds in individual zones on the sorbent, with eluent zones situated between the component zones (Figure l,b). In displacement chromatography the mixture to be separated is first fed to the sorbent, and the carrier gas flow containing the displacing agent (solvent) is then added. Upon movement of the gas carrier over some time, the mixture separates into zones of pure compounds, between which various component mixture zones are found (Figure 1, c). A number of types of chromatography are accomplished by means of instruments called chromatographs; development chromatography is the technique most often used with such instruments. Chromatographs are used for analysis and for preparative (including industrial) separation of mixtures. In analysis, the compounds that are separated in the chromatographic column, together with the eluent, pass a detecting device at the outflow of the column after a certain time interval. The detector records the concentrations of the compounds over time. The exit curve (concentration profile) thus obtained is called a chromatogram. For qualitative chromatographic analysis, the time from the moment of sample injection until the exit of each component from the column is determined for each temperature and use of specific eluent. For quantitative analysis, the height or area of the chromatographic peaks is determined, and the sensitivity coefficients of the detector used with respect to the compounds to be analyzed are taken into account. Gas chromatography, in which helium, nitrogen, argon, and other gases are used as the eluent (carrier gas), is most widely used for the analysis and separation of compounds that pass without decomposition into the gaseous phase. Silica gels, alumina gels, molecular sieves, porous polymers, and other sorbents with a specific surface from 5 to 500 m2/g are used as adsorbents (particle diameter 0.1–0.5 mm) for gas-adsorption chromatography. In gas-liquid chromatography the sorbent is prepared by application of a liquid (esters, siloxanes, and hydrocarbons with high boiling points) as a film with a thickness of several micrometers onto a solid carrier with a specific surface of 0.5–5 m2/g or more. The operating temperatures range from – 70°C to 600°C for gas-adsorption chromatography and from –20°C to 400°C for gas-liquid chromatography. Gas chromatography may separate several cubic centimeters of a gas or several milligrams of a liquid or solid; the analysis time ranges from several seconds to several hours. Volatile solvents, such as hydrocarbons, esters, and alcohols, are used in liquid column chromatography as eluents, and silica gels (including those with various functional groups attached chemically to the surface, such as ester and alcohol groups), alumina gels, and porous glasses are used as the stationary phase; the particle size of these sorbents is several micrometers. By introducing the eluent under pressures up to 50 meganewtons per m2 (500 kg-force per cm2), the analysis time may be reduced from 2–3 hours to several minutes. A time-programmed change in the properties of the eluent, accomplished by mixing solvents of differing polarity (gradient elution), is used to increase the efficiency of the separation of complex mixtures. Liquid molecular sieve chromatography differs in its use of sorbents with pores of a strictly defined size (porous glasses and molecular sieves, including dextran and other gels). In thin-layer and paper chromatography, the mixture to be studied is applied in liquid form to the starting point (the bottom of a plate or paper strip) and then separated into components by a rising or descending flow of eluent. The subsequent observation (development) of the separated compounds in the chromatogram (which is the name in these cases for the plate with applied adsorbent or the chromatographic paper, on which the separation of the mixture into components has been performed) is accomplished using ultraviolet spectroscopy, infrared spectroscopy, or treatment by reagents that form colored products with the analyzed compounds. In such types of chromatography the composition of mixtures is characterized qualitatively by the specific rate of displacement of the compound spots relative to the velocity of the solvent under given conditions. Quantitative analysis is performed by measuring the intensity of the color of a compound in the chromatogram. Chromatography is commonly used in laboratories and in industry to perform qualitative and quantitative analysis of multicomponent systems, to monitor production, especially, with regard to the automation of many processes, to prepare individual substances and to produce them on an industrial scale (for example, noble metals), and to separate rare and dispersed elements. Gas chromatography is used for several purposes: to separate gases; to determine admixtures of harmful substances in air, water, soil, and industrial products; and to determine the composition of the products of basic industrial organic and petrochemical synthesis, exhaust gases, and drugs. It also finds application in forensic science. Analytical equipment and methods have been developed for analyzing the atmosphere in spacecraft and the atmosphere on Mars and for identifying organic compounds in lunar rocks. Gas chromatography is also used to determine the physicochemical characteristics of individual compounds: heat of adsorption, heat of solution, enthalpy, entropy, equilibrium constant, and complex-formation constant. The technique is used in the case of solids to measure specific surface, porosity, and catalytic activity. Liquid chromatography is used for the analysis, separation, and purification of synthetic polymers, drugs, detergents, proteins, hormones and other biologically important compounds. The use of highly sensitive detectors makes it possible to work with very small sample amounts—as little as 10–11–10–9 g—which is extremely important for biological studies. Molecular sieve chromatography and affinity chromatography are used often. The latter technique is based on the capacity of biological compounds to bind with each other. Thin-layer chromatography and paper chromatography are used for the analysis of fats, carbohydrates, proteins, other natural compounds, and inorganic compounds. In some cases, chromatography is used in conjunction with other physicochemical and physical methods, such as mass spectrometry, infrared spectroscopy, and ultraviolet spectroscopy, for the identification of compounds. Computers are used to interpret chromatograms and to select conditions for experiments. Zhukhovitskii, A. A., and N. M. Turkel’taub. Gazovaia khromatografiia. Moscow, 1962. Kiselev, A. V., and Ia. I. Iashin. Gazo-adsorbtsionnaia khromatografiia. Moscow, 1967. Sakodynskii, K. I., and S. A. Volkov. Preparativnaia gazovaia khromatografiia. Moscow, 1972. Gol’bert, K. A., and M. S. Vigdergauz. Kurs gazovoi khromatografii. Moscow, 1974. Morris, C. J. O., and P. Morris. Separation Methods in Biochemistry. London, 1964. A method of separating and analyzing mixtures of chemical substances by chromatographic adsorption. However, the Asian market is slated to grow at the highest CAGR during the forecast period and serve as a revenue pocket for companies offering chromatography systems and consumables. In displacement chromatography, a sample is loaded on the ion-exchange media, followed by a solution of a molecule that binds to the media more tightly than any of the sample components. Topics that the authors do not explore are the explosive growth in proteomics in disease diagnosis, biomarker discovery, and drug-toxicant profiling using retentate chromatography mass spectrometry (RC-MS), and also the growing number of protein/antibody arrays. Supercritical fluid chromatography (SFC) was used to separate individual low mass polystyrene oligomers into distinct fractions. As implied by the definition given earlier for affinity chromatography, most of these ligands are of biological origin; however, the term "affinity chromatography" has also been used throughout the years to describe some columns that contain selective ligands of nonbiological origin. The global chromatography resins market is anticipated to witness an incremental opportunity of over USD 1,000m between 2017 and 2027. On the basis of product type the global chromatography solvents market is segmented into Polar, Non Polar. The Chromatography market is expected to reach USD 9.
of California, Davis, discussing their experience with a new chromatography system from Bio-Rad. The market is expected to witness a high growth due to high demand of chromatography reagents in the growing pharmaceutical market. Traditional Columns and Membrane Chromatography Adsorbers: Traditional column chromatography relies on molecular diffusion to transport the target species through the microporous structure of the resin beads to internal binding sites. Among the objectives of the formation of these two specialized workgroups, mention can be made of sharing and exchanging experiences of laboratorial devices experts in the fields of chromatography and element analysis, identifying educational needs of laboratorial devices experts, holding the required educational workshops, and carrying out common projects in order to install and benefit from the capabilities of the devices.